Education and tourism horse farm "Stajnia Kaliska"
Animals, river, beautiful nature- take a deep breath, and have a taste of the rural balanced life. We welcome children including those with behaviour problems for organized farm holidays full of interesting activities with therapeutical effect. We also welcome daily visitors for horse riding, kayaks, meeting the animals and learning about farm life. • workshops “four seasons on the farm” for children and school youth groups up to 30 people, 3 hours duration. Workshops must be booked at least 1 week in advance. • local excursions – birdwatching, beavers watching, mushroom picking. All year, it’s better to call us before visiting. Food for our guests is based on Polish cuisine and farm products, Our specialty is goat milk and goat cheese, our own vegetables and fruits including raspberries. We make jams, fruit liquors, and a special apple pie from old variety of apple the famous „antonówka”. We have own eggs and breed goats, geese, hens, rabbits, ducks, piglets. It’s a real working farm and some of the products could be purchased for take away. One day of stay for a child, with full board, full care and one hour of riding lesson from 100,00 zł to 150,00 zł. 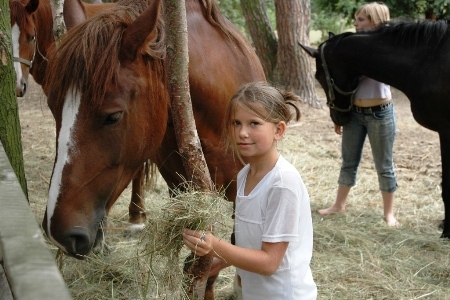 Horse riding lessons for kids 40,00 - 50,00 zł. Kayak rental 50,00 -70,00 zł + transport of kayaks depending on chosen way. 3 hours activities for kids on the farm 35,00 zł. Horse carriage and sleight rides from 70,00 zł per hour, depending on group size, possible to add fire and picnic. Horse riding excursion 5 to 6 hours - 170,00 zł. Maria Konarzewska is a qualified pedagogue, teacher, social worker. Maria and her husband Waldemar have extensive pedagogical experience, they have brought up 6 own children and one adopted. Parents could go for a horse ride lessons or horse excursion and leave with us children from 0,5 to 5 years old under good care. Guests could bring own pets if they are friendly to other animals.